End Result - Begin with the end in mind. What does the final product look like? What purpose does it serve? What message does it convey? A storyboard or graphic organizer helps with the planning of the project. I recommend a Google Doc using the Lucid Chart add on. Apps Smashed - Create a list of apps that will be included in the project. 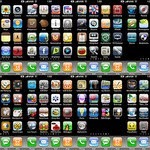 Research and practice with the chosen apps to assess their compatibility, but leave the work details for a later time. Edshelf is a helpful educational website that provides descriptions and reviews of websites, mobile apps, desktop programs, and electronic products for teaching and learning. Digital Workflow - This is when the step-by-step processes of app smashing are spelled out in greater detail. The organizer mentioned earlier now comes into play as specific details and processes are added to the project plan. Create product - Much like piecing together a jigsaw puzzle, it is now time to complete the tasks necessary to create the final digital product. Share product - The "share to" button is one of my favorite features of digital learning. Assuming the product is worthy of sharing, where will the resulting digital artifact reside? Blogs, wikis, websites provide platforms for evidence of student learning as digital portfolios. Interestingly, embedding projects into web pages or blogs is also a simple, but effective, example of app smashing. Here are three apps that lend themselves ideally to app smashing projects. These apps support multiple platforms (iOS, Android, or web), offer numerous input options, and provide flexible sharing options for the user. Thinglink - (iOS, AND, web) allows the creation of interactive, digitally enriched images. Images may be uploaded from the computer, imported from a website, Flickr, or Facebook. Tagging and linking features turns the image into an interactive resource or story. Enhanced images are shareable and embeddable. Create a Thinglink channel for subscribers to follow and comment on completed visual projects. Explain Everything - (iOS, AND) is an app smashing workhorse! Virtually any digital media, including files from Evernote, Dropbox and Google Drive, can be imported and modified with annotations, narrations, and animations. Commonly used as a whiteboard app, Explain Everything has recently been updated with video editing features. Projects can be shared to YouTube, or exported locally as MP4 movies, PDF documents, or PNG images. TouchCast - (iOS, web) does for video what Explain Everything does for presentations. TouchCast allows the creation and sharing of videos containing interactive web content, images, and widgets. Like Thinglink, TouchCast videos feature interactive touch points that viewers can activate, enlarge, and manipulate. Templates are provided to provide newscast style overlays. Projects can be uploaded to YouTube or embedded in webpages. App smashing gives teachers and students the creative freedom to build and share uniquely interactive, interesting digital projects. App smashing is practically a necessity in a 1:1 learning environment because no single app meets every learner's nor every project's needs. Thinglink, Explain Everything, and TouchCast are three shining examples of apps that offer import and export flexibility, which is beneficial to creating personalized artifacts of digital learning. How can these three apps be smashed to create a final, digital project? What are your favorite app smashing combinations?